Long before email and texting, and even the USPS, important messages were passed discreetly from hand to hand. 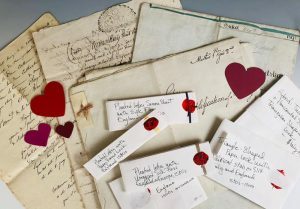 These hand-written notes were often elaborately folded, sealed with wax, and rigged with anti-tamper devices to ensure their security. The technique of “locking” letters involves folding the parchment, papyrus, or paper securely so that the letter functions as its own envelope. Well-known historical figures such as Queen Elizabeth I of England and Marie Antoinette used locked letters for their private communications. Bring with you: Bone Folder, X-acto knife, ruler, small cutting mat, awl, an instrument to write your message (pen, pencils, markers, etc. ), stickers and personal papers encouraged. Thank you all who renewed at our Annual Meeting in November – you are set for 2019! participate in promotion, education, and exhibition of book arts in Alaska. attend our program meetings without paying cost of materials fees. support NBG outreach activities, including book repair at the Literacy Council of Alaska, rotating exhibitions at UAF Rasmuson Library, and the Marilyn Askelin scholarship program. have opportunities to join in creating Northwoods Press publications. get to know others who appreciate and support all aspects of book arts. may purchase locally hard-to-find book supplies at NBG’s Paper Birches.